There is only one London, New York, Tokyo etc yet there are many digital models of each city. London has, at last count, 6 models of varying accuracy and detail, the majority of which are created and held by architecture practices. Investment in the creation of such models can run into six figures and as such the use of highly detailed models are based on commercial licences and restrictive IP. At Digital Urban we hold the view of an open source model allowing the public free access to data and visualisation. It is after all our city and we should have the ability to visualise changes in the public domain. There are of course a number of issues with this point of view, see the recent Guardian Article for more info. Almost certainly, whoever has the most detailed and accurate model of London has the competitive edge. The ability to create a 3D model of a building or other development and simply ‘drop it’ into an accurate model of London quickly and efficiently will inevitably win the support, backing and perhaps more importantly the business of architects and developers in the future. However, the creation of multiple London models may provide competitive advantage to some and an instant win for those that ‘have’, but in the long-term does little to save time and cost for architects, developers and the wider industry. 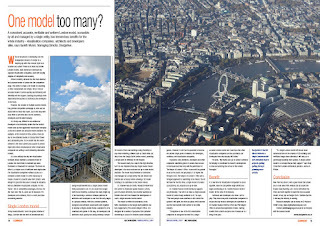 The article is focused on the Virtual London model held at our lab (see our Virtual London thread for more details ) and interestingly the whole magazine can be viewed online, free of charge and without registration in PDF format. 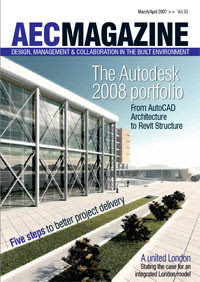 Read the article online or view the magazine in PDF. So should there be one model? How do other cities deal with digital models and getting architects to contribute with a view of online distribution? Answers on a postcard, via email or in our comments thread below.